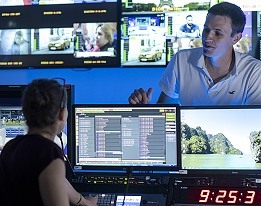 Globecast launches Digital Media Hub at IBC. Paris, August 2018: Globecast is launching at IBC its new Digital Media Hub suite of services for sports and live events. By aggregating multiple virtualized technologies into a single ecosystem, the Digital Media Hub allows a live feed to be treated in multiple ways to create content suitable for cross-platform use, in both real-time or for use at a later date. The live feed can be used for linear playout or to stream to live platforms of the rights holder’s choice, including social media or websites. Using the same live feed, content can be manually or automatically clipped, edited, metadata attached and shared, either short or long-form. For example, highlights clips can be shared quickly on social media to maximize viewer engagement or packages created for OTT platforms. All the clipped content – short and long-form - is then made available via our new Marketplace Platform in multiple formats/different sizes – including at broadcast quality - and branded using customers’ brand guidelines. This platform facilitates content exchange between any relevant parties, including selling that content, in hassle-free transactions. All these services can be easily monitored throughout the process using our digital supervision tool. At IBC, Globecast will be on Stand: A.129.